We’re an established website design & development business serving Austin, Texas. Need proof? Read any one of our 70 testimonials and browse our portfolio. 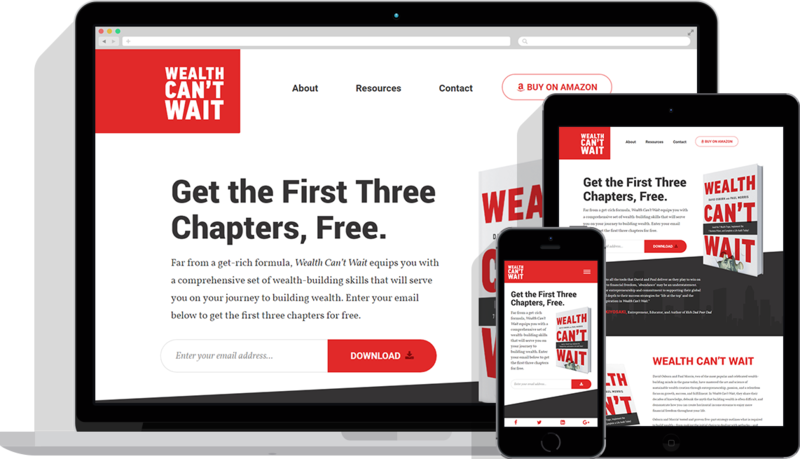 With the book launch only three weeks away, the staff for Wealth Can't Wait approached us to deliver a website. Not only did they need a website to showcase the new book, but they needed one that was conversion focused. They wanted to give away the first three chapters of their book and also feature the various resources as mentioned in the book. We integrated all of the forms/opt-in's with Drip and also created their campaigns as well. The end result was a beautiful, mobile responsive website that they were very pleased with and has been extremely effective since the book launch. I should also mention, their staff is now able to manage their website in-house with a customized dashboard for easy editing (along with training videos). And yes, we delivered the website in three weeks, before the book launched!